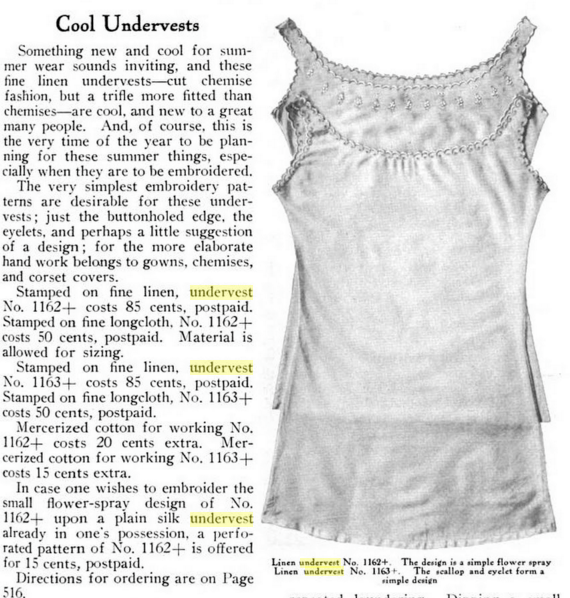 Home » 1900s » An Argument for Under Vests- or- Are We Over-Simplifying 1900s Underwear? I have a hypothesis that’s been a long time coming. It started by observing advertisements in old magazines, then spotting articles in my old catalogs. Finally I gave up, did a search, and I am starting to believe my feeling is correct. In simple terms- I may have been more period correct than I knew when I wore my long knit tank tops under my corset in place of a chemise. Now, don’t get me wrong. I love a good ol’ chemise just like any other die-hard historical addict. But sometimes it’s hot. Sometimes it’s bulky (even if of fine fabric). Sometimes the neckline shows unfavorably under the gown or blouse. And that’s when the tank top comes to the rescue. It was my dirty little secret. I love historical accuracy and I didn’t share it except when I found others who “cheated”, too. And so I start my little search. This is still ongoing, but here’s what I’ve found so far. There WERE things called “undervests.” In fact, it looks like for a while the chemise was considered “old fashioned.” And then, in the 19-teens, when “old fashioned” was La Mode again, the chemise made a resurgence. Think of it like this- you’ve got a piece of clothing you love. You keep your clothing. You wear it. The company still may even make it, even if it’s considered to be out of fashion. And then Dame Fashion says it’s in vogue again, and you can proudly wear your article of clothing and claim you never gave it up. And you’re cool again. Chemises are kind of like that, from what I’ve been reading. “The chemise is greatly worn. Many women have never abandoned it for any of the more snugly fitted combinations, and during the large-waisted, straight-figure era it has been as well suited to the situation as anything, provided, of course, it is made of very fine soft material so that it will give no bulkiness about the hips. A chemise vest has found considerable favor as a substitute for the more closely clinging undervest, and is merely a chemise cut short to ordinary undervest length. It is made in lingerie or crepe and may be trimmed as daintily as any chemise about the top, presenting a much daintier appearance when the corset cover is off than any ordinary undervest does. From The Corset and Underwear Review, 1915. Page 81-82. 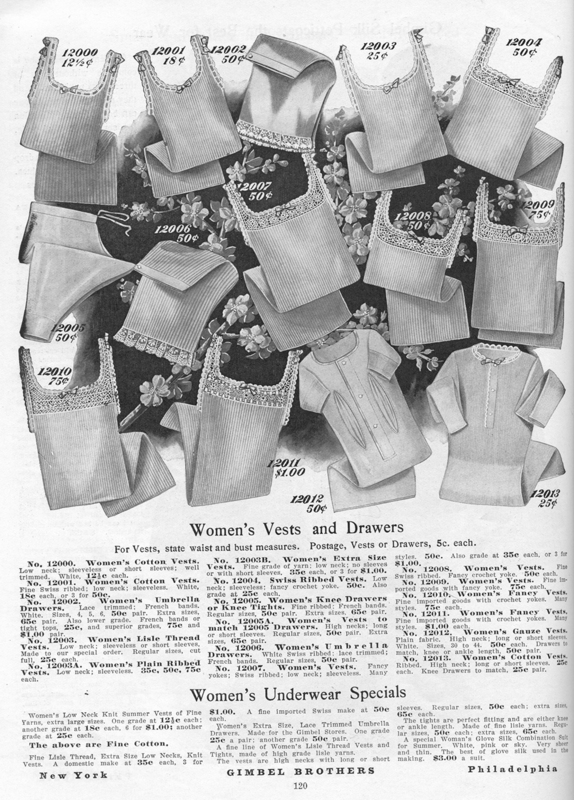 The underwear fashions moved SO QUICKLY in the early part of the 20th century. There were endless combinations of what you could wear (including combinations… yuk yuk). This year everyone needs combinations that had wide legs. In five years, everyone wants narrow legs. There was even a short time span when bloomers with drawn in legs (like the old cartoons), and hoop skirts came back. No, really, look it up. It’s no joke. But I digress… back to the tank tops… err.. I mean under vests (which could or could not have sleeves, by the way. The extra fashionable ones seemed to have convertible straps for a while so they could go from day to evening). But just a little later and I find my definitive answer. Harper’s Bazaar, 1897- page 845. Well, there it is in black and white. Sure, a little earlier than the era I was looking for originally, but it was a standard option. Why else would the under vests continue to be mentioned? The Dry Goods Reporter, 1902. And I am still finding even more mentions of them. I’ve even found mentions of women’s union suits being worn under corsets because the buttons are small enough to prevent rubbing. But, of course, I forgot to bookmark that find. So why did they go out of fashion? 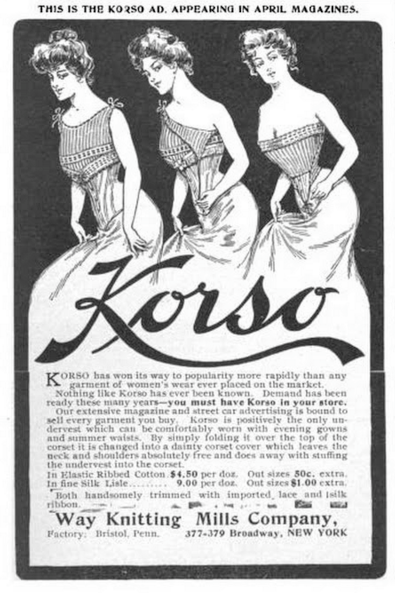 Well, it seems women started favoring chemises again because the undervests were so short that they were continually having to tug them down under the newer long-line corsets. The knit combination suits stuck around for a while, though! So what do you think? Does this change your perception of what historical underwear was like? I don’t know about you, but I’m going to make a period appropriate knit undervest and wear it with pride! 3 Comments on An Argument for Under Vests- or- Are We Over-Simplifying 1900s Underwear? Fascinating observation and research! It’s so lovely to find out that you’ve been onto an idea that made sense and was actually in practice in the past. Well done, and thank you for sharing with us. I seriously want to make one now! Thank you for the research! Anyway – I thought it was a modern filmmaking shortcut which was slightly disappointing because despite the film being all over the place, it was rather clear the filmmakers usually based everything in it on *something*. So it’s nice to see years after the fact that they probably did even in this case!